Census is the complete enumeration of a population or groups at a point in time with respect of well-defined characteristics [OECD]. Census was known to originate during the Roman time in order to identify and track adult males fit for military service. A comprehensive well rounded census helps to define a picture of the populations’ socio-economic condition of certain country or region and helps for effective and efficient policy planning and decision-making process. In a so called normal circumstance, census data is helpful to governments and service providers in order to allocate their services effectively across the country or targeted population. In most cases the service provided from the knowledge/information gathered through census enhance the development and quality of life of the targeted audience. Census has the ability to gather all the relevant data such as gender, age, race, education, income, occupation of the target population and helps define the population holistically, however this comes with high financial cost and time in the gathering, evaluation and analysis of the data. The alternative to census is sampling and with this a sample data is collected from a segment of the target population. Sampling is cheaper as compared to census; however it doesn’t give accurate population size and demographic data with regard to sub-population. Census result is not always taken on face value in many countries and by many organizations around the world. The primary reason for this is that the survey process & procedure, the questionnaire and/or final numbers can be skewed to reflect a predefined goal and this is known as politics of census. The 2006 census of Nigeria, 2007 census of Ethiopia, 2011 census of Canada and 2014 census of Burma are prime examples of this. The politics of census or lack of it is a strong tool in a country were the rule of law either doesn’t exist or easily misinterpreted & abused in support of certain people’s or groups agenda in order to discriminate a group or section of the society. It creates under representation and under privilege of certain demographics in a country and leads to discrimination on access to health care, housing, education and jobs to list a few. The Eritrean Demographics and Health Survey study was repeated in 2002 (EDHS 2002) which was carried out by the National Statistics and Evaluation Office of Eritrea with financial support provided by USAID & Eritrean Ministry of Health, on the population section of the survey report again it stated that “No population census has ever been carried out in Eritrea. As a result, there are no reliable estimates of the population currently residing in Eritrea or the population of Eritreans living abroad” The EDHS 2002 survey in itself was sample survey covering 9,389 households and 8,754 women age of 15-49 years focusing primarily on women’s & child health care. Historically, in the 1950’s a sample based population estimate was done in the province of Eritrea mainly in the urban areas with head counts by the ministry of interior for tax and parliamentary representation purpose [Kloos & Adugna]. In the wider Ethiopia in general there were 11 sample based population survey’s in the rural and urban areas between 1950’s and 1981, these were not a comprehensive census covering the whole geographical location but based on estimate, predication and defective data from an earlier sample survey’s. In 1984, the first comprehensive population study was carried out across Ethiopia covering to the sub-district (Wereda) level. However due to security concern the province of Eritrea was excluded from the survey in addition to a section of Tigray and Harerge provinces. The 1984 Ethiopian census with estimate coverage of 85% of the population came to 42million. What propelled the author of this article to write on this subject was the perplexity when reading a number of Eritrean cyber articles & debates written by cyber warriors wereby certain individuals or groups use Eritrean demographic statistic data without validating it to support and enforce their argument and debate on their right to dominate the Eritrean socio-economic, cultural and political sphere without making sure that their number stands scrutiny were actual census data is lacking in the first place. In most cases people state the demographic numbers they find in CIA fact book or Wikipedia as the base of their argument, but relying solely on this approach will weaken their argument because estimated numbers doesn’t stand the test of time. CIA World Fact book in its Frequently Asked Questions (FAQ) segment states that its numbers are based on estimates and projections when no census data is available for a country. However to have a stronger estimate and projection result, data have to start with a solid actuals such as comprehensive census or all inclusive population head count. Almost all available Eritrean demographics and population data is based on estimates and projection, I decided to do the same with the available 1952 data obtained from awate.com as the foundation of my analysis. 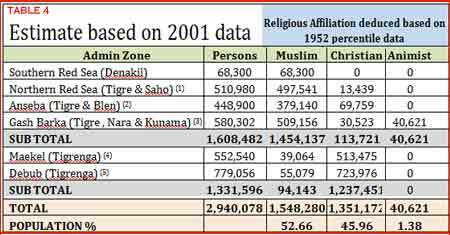 One of my reasons for doing so was that the 1952 data not only has head-count information it also has religious affiliation as shown below in Table 1, which was absent in the 1997 & 2001 population estimate data provided by Eritrean Ministry of Local Government. Based on Table 1, we can deduce that the percentile on religion affiliation by region as shown below on Table 2. *In this analysis based on the 1952 demographics description, the term Nara will be used instead of BARYA for the NARA ethnic group. The next step is to create estimates on religious affiliation data by region for the 1997 and 2001 data with the following assumption. The proportion of religious affiliation by region ratio remained similar between 1952 and 2001. This assumption will stand until other contradictory data is available. Eritreans in diaspora will not be considered in this estimate as the author doesn’t want to include additional variables. Table 3 and Table 4 below shows the estimate Eritrean population demographics affiliation by region based on the assumption stated above. To make thing a little bit interesting, let us skew the second assumption on the demographics of the new administration zone and postulate on what if the new boundaries not only takes land away from the former highland provinces (Akele Guzay, Hamasien & Seraye) but also a portion of its population. 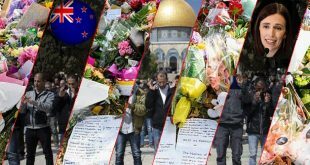 This could affect the religious affiliation by region and its proportion based on the 1952 data. 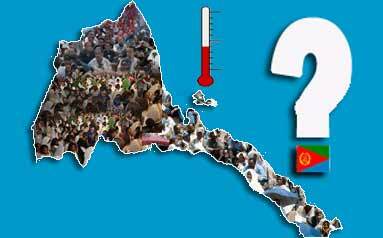 Just as a disclaimer, the author has no knowledge or data on the impact of the boundary changes on the demographics of the former Eritrean provinces, this exercise is theoretical in order to squish the thirst for knowledge in the absence of solid data. To test the above scenario using the 2001 data, the population data is skewed by 5% for the Northern Read Sea, Anseba and Gash Barka administration zone be from former highland provinces and all be from the Christian demographics segment in order to offset the impact of boundary change. (This is based on hypothetical theory with hypothetical percentage as the author does not have any actual data for this analysis). The summary of the analysis of the 1997, 2001 and 2001skewed numbers by geography and religious affiliation below shows the population difference between the two geographical locations. For many reasons the Eritrean demographics number is a hotly debated and challenged topic, the author encourages the readers to analyze and critic this document and its outlined figures in order to advance the understanding of current Eritrean demography. The author believes that just because a demographic figures are found somewhere in the internet (be it Wikipedia or CIA fact book or other), it should not be taken on face value but be reviewed and analysed instead of being regurgitated unless otherwise it is proven to come from a comprehensive unbiased census data. Finally, from this exercise the author also believes that all Eritrean ethnic groups are majority in their own land and region; therefore they should not be seen or be treated as minorities just to make others feel comfortable. I wrote the article to challenge & provoke the current Eritrean demographics numbers and make people question the numbers & percentile currently available in order to get a better picture as it is difficult to produce close to accurate number based on assumptions and estimates. across the world be developed or developing. What is happening in Eritrea is also the same, what is exceptional about it is though the unavailability or inaccessibility of data is used as a tool to reach the same goal. @Tes, the only data that is accessible online is the three that I used (1952, 1997 & 2001), if you have any latest data, I would be more than happy to use it. @Dawit, as I mentioned in the article, the 1952 data is not fully accurate as it is based on sample and estimate as well as it didn’t cover the whole country. It was mainly collected from urban areas, however as compared to 1997 & 2001, the 1952 data describes the Eritrean demographics better and that is why I chose 1952 as a reference (Control data) to compare and analyse the rest of the data. gets bigger and bigger and the number gets skewed. 2. Since the 1952 count was mainly based in urban areas and most urban places in Eritrea were in the highland, the lowland population which was mainly living in the sub urban and rural areas were not represented accurately and this won’t reflect the true actual lowland population number. 1. The new administration zone boundaries might have introduced biasness to the analysis data when compared to the historical boundaries. 2. Eritrean refugees to some extend returning to their lowland homeland individually from Sudan. Some older refugees who been in Sudanese refugee camp for over 40 years might want to come back home and see their home land before they depart this world. 3. Migration settlement of highlanders in the lowland area will also alter the demographics and population ratio. This is just an analysis of one individual and not more or less. I thank people who have commented and encourage more people to do so. A sharp climb from 1952 to 1997(increasing rate of population growth within 45 years). Can Wadi Amir explain as to why the difference in population growth rate between Muslims and Christians has existed. Is it because of relative peace. 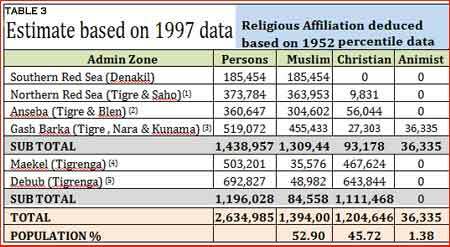 There is also a noticeable difference between the size of the population of Muslims and Christians from 1997 to 2001 (any explanation for this?). If that trend continues, the difference in 2014 would be substantial. Here the lowland population climbs at a higher rate than the highland population. What is the explanation? Is it because highlanders have been making the low-land their dwelling places. In other words, are highlanders migrating to the lowland? Again, if this trend continues, Muslims would be by far the majority. Future policy makers will certainly take this into consideration. I will not comment on your 2 points, because I have limited knowledge on the issues. Can you answer me why it is important that 75% of Eritrea’s land is inhabited by Muslims? does it mean that no Christians are allowed to live there in the future? what difference would it make if Eritrea consisted of 80% Muslim population, what would the difference be in how Eritrea is governed? (assuming that we have a democracy and distribution of opportunities/positions according to respective numbers). At what percentage would Eritrea as a whole be ruled by Sharia law as in Saudi Arabia? The balancing factor in the 1950s, in favor of the Tigrinya population, would have been the Tigrayans. There are still many living today in Eritrea away from the general public scrutiny and while hiding their origins although many thousands were expelled from Eritrea (during and after the 1998-2000 border war)- who were by far more than the Eritreans expelled from Ethiopia. 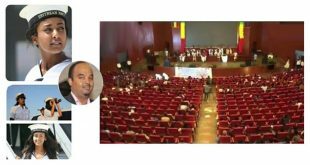 This factor cannot be ignored or under-estimated since Isaias is widely believed to be from Tigray, in addition to the two Yemanes, Hagos Kisha and ERI- TV director Asmalash. Conservative figures indicate that half-a-million Eritrean Muslims were forced to flee their villages in the late 1960s and early 1970s due to dreadful Ethiopian “scorched land” policy. Sadly, the regime in Eritrea refused to accept the return of the refugees to their ancestral land, after independence, putting different hurdles and drive-away measures on their return. Moreover, the mafia bandits continue to distribute the land in their absence to new settlers from the highlands / Kebessa, a land-grab policy aimed at changing the regions demographics. Truth is like the sun and no one can never block it’s rays… for sure everything will come out one day. Knowing that every government in the world is obsessed with census as it is a vital tool for policy and long term planning, what is holding PFDJ government from conducting and declaring the results of a census? Because it will help to keep the myth that Eritrea 50% christian 50% muslim population. Not a per cent less or a per cent more. It is a joke! When was the last census conducted in Eritrea? During Haile Slassie era? The Derg era? I don’t think any government in Eritrea will conduct any census. If it did, it will never publish the results. Who is going to be brave enough to face truth that there are more muslim than christian Eritreans, or vice-versa. well, let me see the positive side only and learn about the past statistics,might be correct or might not. But the free and democratic Eritrea will have the perfect data and it seems to me it is the job to be done in the future. 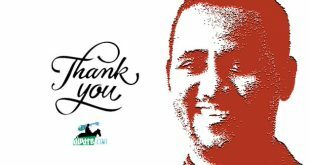 now we have one small but important job that should be done to start the big job of building the nation and that is removing PFDJ. ” ቅድሚ ኹሉ ምዕቡል ኣተሓሳስባ” said my friend Kamal. Please check the original source of the image. If you are not sure, or you do not have permission, don’t post. Unknowingly you might be encouraging plagiarizers. I just copy it from my friend as i have mentioned above. I didn’t even think of as i was only attracted with the message. sorry and you can delete it simply. Yes indeed there are nara and kunama languages whether it is written or dialect. Infact the kunama people use latin alfabets the same as tigrina use geeze alfabets. That should not be part of your argument. You could question the validity of the data but not the existence of the language. Yes, thank you Amaniel. I know both languages exist in Eritrea since decades separatedly. Baria the speaker of the Nara languge, and the Kunama, with speakers of the Kunama language. That is not the case am pointing for. There is no language called “Baria & Kunama” as put in Table 2. Wed Amir had failed to deal on both languages separetedly and for me that was a deliberate action to devalue both ethnics and that was my point. He should have done separatedly as he did on the rest languages or else he should leave as it is as open-ended as usual. His reason for this, as usual, is going to be no substantiated figures for both ethnics and that is still a deliberate action. It is to be appreciated that you attempted to deal with this issue in one way. The problem, as I see it, is that you don’t really have to insist either we have accurate data or shut up. Despite your extended inferences, you still came out with the generally held belief that with the exception of Tigrinya and Tigre, all of the rest of Eritrea’s ethnic groups make a small single digit percentage of the population each. The Moslem vs Christian divide is in the region of half and half (give or take few % points) and Islam is dominant (high 70s percentile) in the lowlands and Christianity in the highland. Basically, after all that calculation, you didn’t really arrive at any significant deviation from the commonly held assumption. The few % points to make 48:52 on Christian and moslem is not hugely significant. So, i fail to see your critic of people who use NGO data when your own research painted pretty much similar patterns and ratios of demographic distribution. Just as you don’t trust Wikipedia’s, and CIA Fact book’s census data, there are many Eritreans who also don’t trust the census data of PFDJ whether or not it was conducted by a third party (NGOs). Your statistical inference is based on one important assumption: the assumption that the census of 1952 is to some degree an accurate description of the size of the population. However, you are drawing conclusion based upon data collected 62 years ago. In 1952, the census may have been affected by the methods used to collect data, the people in charge of collecting the data, the rate of migration, and the purpose of collecting the census. These factors can greatly affect the result of the census and by extension your statistical inferences about the recent Eritrean population size and make up. In 1952, 62 years ago, there were hundreds of thousands of Ethiopians, thousands of Italians, Sudanese, and Yemenis living in Eritrea. Likewise, there were tens of thousands of Eritreans living in Ethiopia, as well as Sudan. In addition, your estimate does not take into account the death rate which is generally very high among rural areas as opposed to urban areas. With that said, what makes you different from those you label “cyber-warriors” who, according to you, “use Eritrean demographic statistic data without validating” its veracity. Shouldn’t we also cast doubt on your statistical inferences? Dear writer, what is your point? What are you trying to prove? I don’t understand some of the Awate writers’ mentality… Nezi kitgi’ta do trihtsa! your estimated data of 13 years back makes it old. why don’t you estimate for 2012 or 2014, it could better give a sound picture. As far as I know, there are more recent surveys done though not accessible. What I appreciate is, your provoking idea on a statistical based arguments, and what I do criticize is, still your analysis is one dimensional and will serve for the “Divide and Rule”political approach, be it: religious, ethnical or regional. Shame for this.